This column was written by Gene Poteat and William Anderson. More than two centuries ago we Americans thought it necessary to send you, our British cousins, a declaration which brought about a permanent separation of our political systems. Yet we retained a reverence for those freedoms which have always characterized our heritage. In a spirit of fraternal fellowship, and with equal urgency, we now write a second time. First, we recognize that the last century has been one of critical challenges and hazards in which, together, we have triumphed in the face of mortal dangers. That partnership, then vital for victory, is now in jeopardy. Our military and economic cooperation are well known. Less fully appreciated, yet of equal importance, has been our close alliance in matters of intelligence, technology, and national security. For example, we greatly appreciated your sending us the Zimmerman telegram, which proposed a German-Mexican alliance, just before World War I. We know you appreciated our response. This unprecedented sharing of the most sensitive intelligence continued throughout World War II and the Cold War, with the inevitable result — victory. This sharing of intelligence still continues, even expanding to include participation in and a degree of control of America's most sophisticated intelligence collection systems. Further, the sharing of nuclear weapons, submarine ballistic missile technology, and stealth aircraft makes a clear statement to our adversaries, as well as the rest of the world. We are also aware that this close fraternal tie has not been without occasional bouts of dyspepsia for you. Your perspective at times has been that our manners are coarse, our politics arcane, and our assistance less than timely. And in candor, your criticisms sometimes have merit. More than that, we are aware that your elite establishment and media thoroughly detest us. They seem eager to make common cause with those of similar perspective across the Channel, so as to exclude us from Europe and from the special relationship that we have enjoyed with you for almost a century. We, on the other hand, forbear to embrace attitudes of antipathy toward you. We rather like you British, actually. True, we see you as a bit on the stuffy side, but on the whole we respect your love of freedom, your prudence, and your splendid use of our sometimes common language. But now comes a message from you that the British future will no longer be tied to America and the English speaking nations. Now not only your transnational elite, but your entire citizenry appear prepared to scuttle the special relationship that has served us all so well, we thought. Opinion polls indicate that the British public believes that America is the main focus of evil and danger in the modern world, and that close integration with the European Union is the preferred measure for future alliance building. It might be tempting to assume that you can have it all — to embrace the European Union, even with its regulatory baggage and democratic deficit, while retaining such ties with America and the Anglosphere as would enhance British economic and military security. With deepest regret, we suggest that this will not happen. The European Union has its own perspective on international affairs and the disciplines which support them. Its position may fairly be summarized by the assumption that the world is no longer a very dangerous place. Or that it would not be were it not for irresponsible Americans. Any international disputes should be manageable, they believe, by skilled diplomacy and the application of international law as developed by the United Nations and other supranational institutions. If only the Americans would abandon their propensity to act unilaterally, in ignorance of the received wisdom of the world community, best expressed by the view from Brussels. There is no room for America or the Commonwealth in this formulation. With deepest respect, this view is a dangerous fantasy. Law without sanction is not law. Law without force to sustain it is idle dreaming. A worldwide totalitarian movement has declared war on our common civilization. No collection of resolutions, however cleverly drafted, will restrain it. Thus, the notion of the European Union that this challenge may be met by the means of criminal law is fatally flawed. 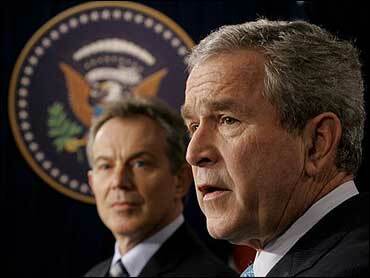 The special relationship between Great Britain and the United States has had many facets. The most important ones have had to do with military coordination and, especially, the sharing of intelligence. If and when you decide to cast your lot with the European Union, this coordination and sharing will likely end. The European Union is establishing its own rules regarding intelligence sharing and will insist that you follow them. We, on the other hand, recognize that the European Union considers itself our competitor and, frequently, our antagonist. Thus we cannot integrate our most sensitive information systems with them. In short, you must choose. In doing so, we urge you to keep some things in mind: America is the world's greatest economic and military power, and will remain so for the foreseeable future. The trajectory of these factors will be increasingly unfavorable to the European Union because of the relentless demographics of their shrinking and aging populations. The developing multicultural makeup of Europe brings with it inevitable dilution of the perspectives and values once thought to comprise Western civilization. As we see it, the United Kingdom is considering debarking from a sturdy ship and climbing onto a sinking one. In doing so, you would abandon your only true friends. We should not need to remind you that these include Australia, Canada, New Zealand, and some of the Commonwealth, as well as ourselves. Perhaps you have already made up your minds. Perhaps it is already too late. But think about what you are giving up. We will not turn our backs on you. Yet, if you integrate your intelligence services with the European Union, there is only so much we can do. We will try our best to aid you in the great struggle that is now beginning. The gathering storm is there for all but the willfully blind to see. But we will have a greater chance for victory if, as before, we fight together.